Some people think that lawn care is just about keeping up to date with your lawn mowing. 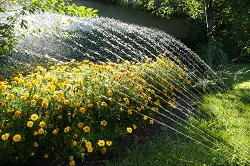 However, taking care of your lawn is one of the most difficult gardening jobs there is. That is why our gardening experts in the W4 regions have put together a specialist lawn maintenance service which can help you to keep your lawn looking great. So, if your lawn looks dehydrated or full of weeds, our weeding and feeding programme could be just what you need. Our Chiswick lawn planting service is also ideal for any lawns which are starting to look sparse or bald and can serve to thicken them up in just a few visits. Keeping your grass at an ideal height is essential for maintaining its flawless and lusciously green appearance. To help with this our gardening company in Chiswick has invested in state-of-the-art lawn mowing equipment which has been designed to cut grass to its optimum level. Aiming to keep your grass healthy and well-nourished, our grass cutting package is an essential gardening service which can keep the heart of your garden looking flawlessly maintained. In conjunction with our exceptional lawn care programme, this service can prove to be an integral part of your garden maintenance in W4. When you hire a gardening professional in W4 it doesn’t have to cost you a fortune. Lawn mowing, planting and leaf clearance is no problem for our handy team who have all the equipment they need to get things done in just one visit. So don’t think that you have to endure the garden clean up all by yourself, when our teams in Chiswick are on hand to help. If you enjoy taking day-to-day care of your lawn but think that you could benefit from some additional help with your in-depth lawn care then our annual lawn restoration and repair treatment could be the perfect solution. Our intense lawn maintenance service we offer across Chiswick includes everything from scarifying and aerating to weed control and garden spraying. Our thorough service is guaranteed to help your lawn stay in an immaculate condition throughout the rest of the year and will never leave you wishing you’d done anything more. 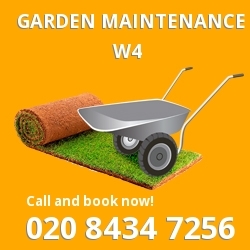 With many years of training and a varied gardening experience, our W4 gardening experts can help you with anything that you need. Knowledgeable on all sorts of European and exotic plants, flowers and trees, our gardening professionals can create anything from even your wildest of dreams. Enchanting fairy tale delights, Japanese tea gardens or English cottage designs are no problem for our landscaping team in Chiswick, while our chic and sleek urban retreats are sure to impress. So whatever garden design you want for your outside space, our Chiswick team are bound to be able to help.